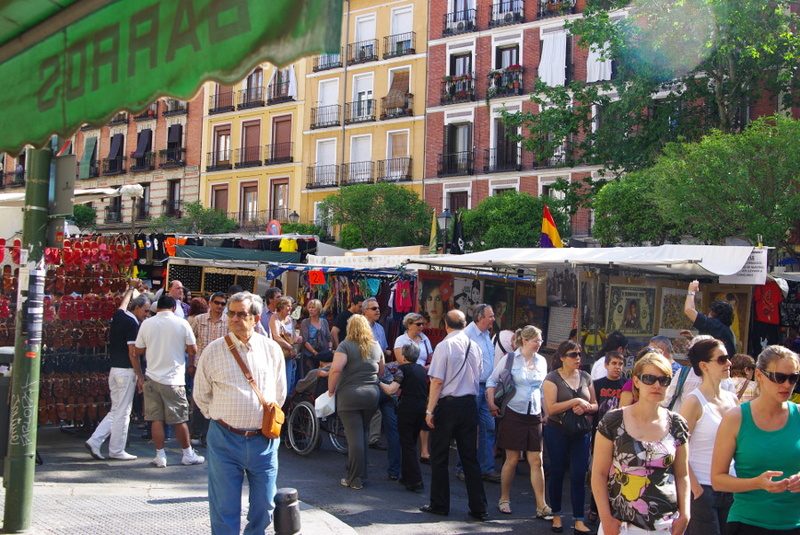 On Sunday morning you have to go to El Rastro of Madrid – the most famous and popular market in the capital city. The first sellers appear there at 8.30 – 9.00 a.m. and they stay there until 2.00 p.m. The best idea is to wake up early, drink some coffee, eat “tostadas” and go to La Latina district to buy something unusual for you. The easiest way to get there is to do it by metro (La Latina metro station – green line/no. 5 or Tirso de Molina metro station – blue line/no. 1). 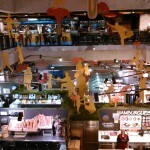 If you arrive there early, you will avoid the crowd, because later, from 10 o’clock, the market is full of people. 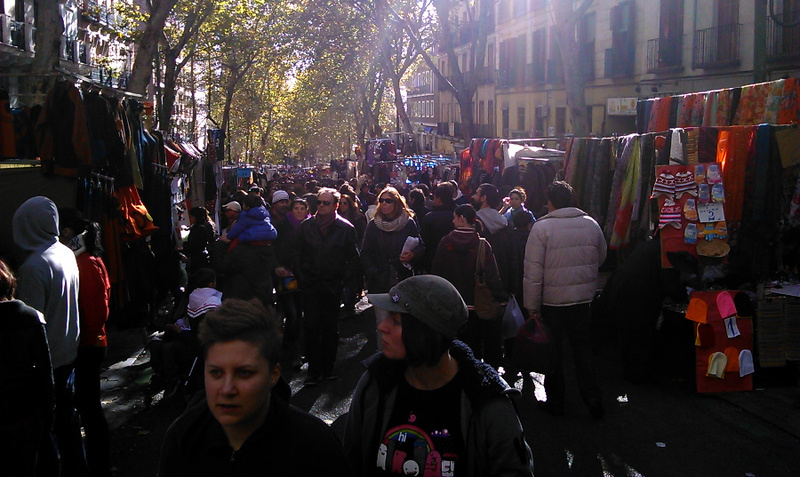 The main market is situated on Ribera de Curtidores Street and its surroundings. Also the nearest streets and squares are full of sellers, so it’s almost impossible to see everything in one day. It is an unique place in the capital city, where you can buy everything, starting from t-shirts with the photos of Marlin Monroe or James Dean and ending on the old, massive desk from XVI century. You will also find there flowers, plants, toys, CDs, clothes, shoes, decorations, mirrors, souvenirs, lamps, furniture, books and antiques. Most of these things are very interesting and worth looking at. Also the prices seem to be attractive. The market takes place every Sunday from the morning until 2 p.m. Be ready! It’s always full of people and… thieves! So, be very careful with your things, because unfortunately every Sunday the police has a lot of work… It’s definitely worth-seeing place, but don’t forget to hide well your precious things, especially if you are a tourist and you don’t speak Spanish. To walk through the Rastro and to see the most important part of it, you need around 3 hours. I recommend you to take a break and spend some time in t he pubs of the area and drink a beer. That would be a great time to consider your shopping decisions. 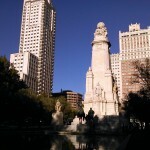 – La Latina: La Latina is a central neighborhood of Madrid whose bars and restaurants are highly popular among the citizens. At the weekends, La Latina is always full of people, especially on Sunday at lunch and dinner time, but also in the afternoon and night. 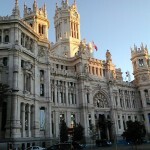 – Plaza Mayor: In this traditional square there is a Felipe II statue rounded of white ancient buildings. 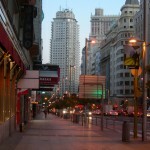 – Gran Via: The most famous avenue of Madrid. It has a lot of theaters, coffee and ice cream shops. – San Miguel Market: Inside of this famous market you will find an incredibly variety of food: juices, “tapas”, “croquetas”, hamburgers, fruit, fish… all of this of the highest quality.